This English grammar course will teach you how to use prefixes and suffixes to form new words from other words, which will greatly enrich your English vocabulary. You will become familiar with how to use different adjectives to describe English nouns, and will also learn how to describe your feelings in English. This course also includes listening, speaking, and reading exercises that will enhance your English ability more broadly. This English grammar course will first introduce you to suffixes and gerunds. You will study a list of suffixes that will help you form new words as well as learn how gerunds can be used with other words in a phrase. The course will also teach you how to form adjectives by adding letters to the end of the word such as 'wealth + y = wealthy' and beginning of a word such as 'un + happy = unhappy'. You will then study how to form adjectives from other words using suffixes such as 'physics' and 'physical'. The course will also teach you how to add prefixes and suffixes to words (known as morphemes) when you change their forms. You will learn that how you say something or the way you say something is important and makes a difference in how you will be perceived or understood by a listener. Prefixes and suffixes can greatly change the meaning of a word. This makes it essential for every English learner to study how these words can be formed. By the end of this free English course you will have a much stronger understanding of word forms and also the importance of using the right tone and pitch in speaking. The course has an easy-to-follow outline that is designed to make the learning process really enjoyable, so check it out today and start bringing your English to the next level. Define what suffixes are and explain how they are used. Explain what gerunds are, define their form and prove how they are used in the same way as nouns. 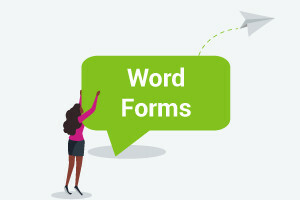 Describe how adjectives are formed using other words and explain the role of suffixes (morphemes). Summarize how we add letters (prefixes) to the beginning of words to make adjectives. Outline the meaning of sympathy in communication skills and be able to provide examples. Analyse how listening and speaking (including tone and pitch) plays an important part in communicating with others. Justify why being able to talk about and understand feelings is an important part of communicating in English. Trace how certain verbs change their form to become different words with different meanings.